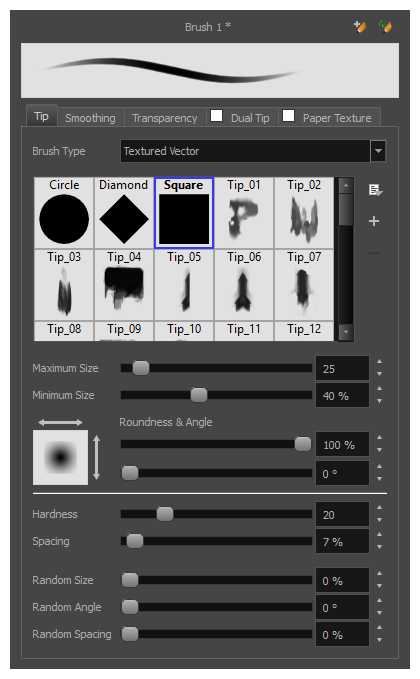 Solid brush tips are not customizable. The selection is limited to either a circle, diamond or square-shaped brush tip, the proportions and angle of which can be adjusted. While Harmony also comes bundled with preset textured brush tips, it is also possible to create and use your own textured brush tips. Use the Spacing slider to set how much distance you must drag your brush before Harmony prints the brush tip onto your canvas, relative to your brush's size. The default setting is 7%, which produces a relatively realistic brush stroke-like result. If this setting is too low, your brush strokes might feel too thick and opaque. If this setting is too high, your strokes will look like the brush tip has been stamped repeatedly over your canvas instead of dragged on it. It is also possible to use textures when drawing with the Pencil tool. Those textures follow the angle of your pencil lines, which may create more interesting results depending on your desired drawing style. For more information, see About Pencil Line Textures.